As the economy and workforce near 2020, the trend toward the gig economy and independent workers is increasing. A gig economy is an environment in which temporary positions are common, allowing independent workers to be contracted by organizations for short periods of time. This enables workers to work a balanced life in fields that they desire. Research by Intuit predicted that by 2020, 40 percent of American workers would be independent contractors. However, with the age of a new workforce, new problems are presented. A recent report published by Gallup discussed the dichotomy of the gig economy. Companies that work with freelance workers will have a hard time practicing traditional management, but will also have the advantages of acquiring talented and specialized workers in a fast-place marketplace. Managers working with independent workers will have to identify the best projects for the workers while being less engaged and having minimal control over the workers’ performance. This presents problems for the manager, requiring them to be strong leaders who can communicate and quickly identify the strengths of the independent worker. MIT Technology Review responded to the Gallup report by providing statistics that responded to the new problems presented to the worker-employer relationships that the gig economy creates. According to MIT Technology review, 64 percent of gig workers said they are doing their preferred type of work, which is close to the 71 percent of traditional workers who said the same. Although, this statistic comes from an undefined measurement of workers who have many different arrangements with their employers. 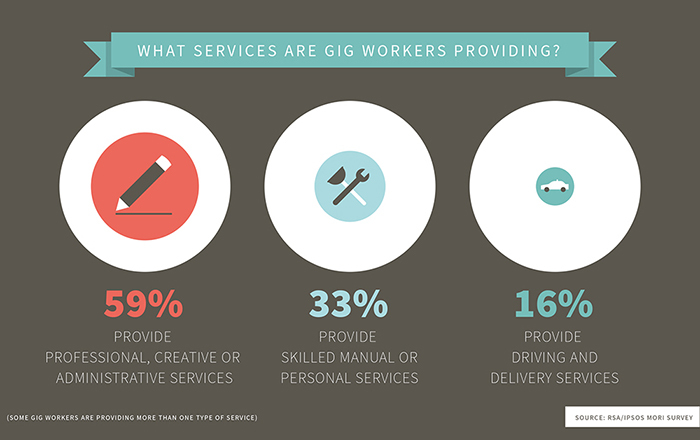 Independent gig workers, which are freelancers and online platform workers, have a different work experience than temporary or on-call workers. Independent workers have a freedom that on-call workers do not have, enabling them to have an optimal work-life balance. Meanwhile, workers who are on-call are essentially employees with no benefits or stability. In correlation to the statistics MIT Technology Review Provides, Gallup offers solutions to business by advising them to treat employees similar to independent contractors. This will allow temporary workers to feel they have opportunities to set goals for themselves and gain a sense of belonging in the workplace.